I have some friends, a couple that I met early on in their gift shop when I moved in my twenties to NC. We became acquaintances, then friends, sharing many a conversation over our mutual love of animals. 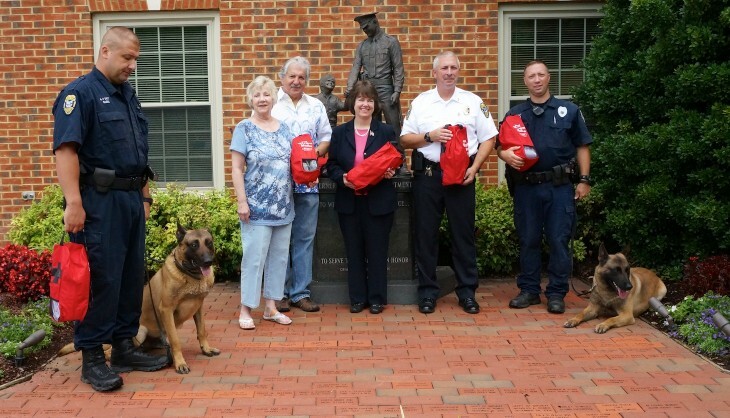 Last week they were honored by their home city and police department for a lifesaving donation of K-9 rescue oxygen apparatus to their Police Department. The canines in the department are considered officers, just the four legged kind, and they work incredibly hard, often tracking or working in extremely high heat and humidity. 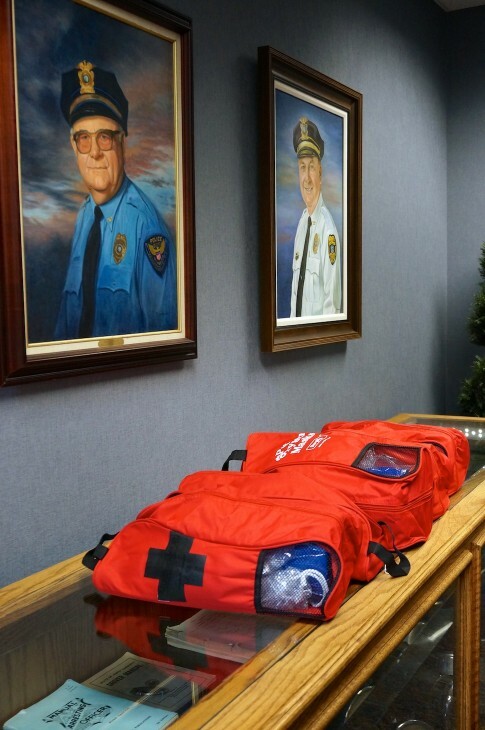 If they were in distress, and EMS was unavailable, their lives were often in peril, until now. Buddy and Susan had already donated 3 of these oxygen apparatus to the fire department to use for animal victims of a fire. They got to wondering about how the police protect their canines, thus another donation. 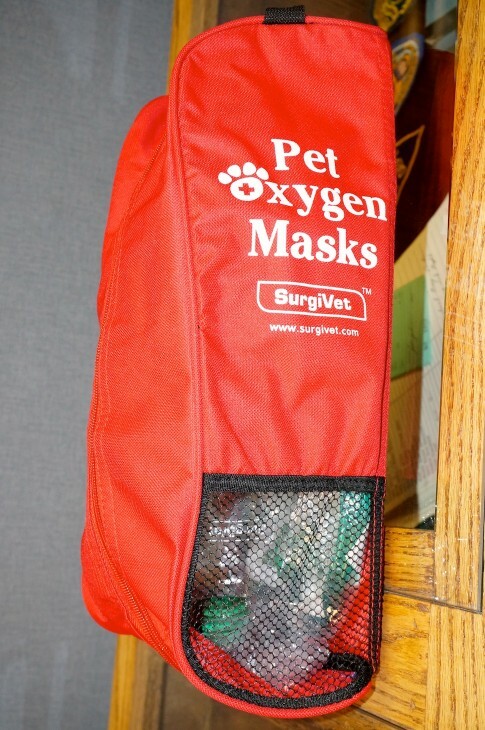 These masks are specifically designed for the K-9 team should the need arrive, and their officer handlers will be able to respond immediately by giving the dog CPR using these masks. 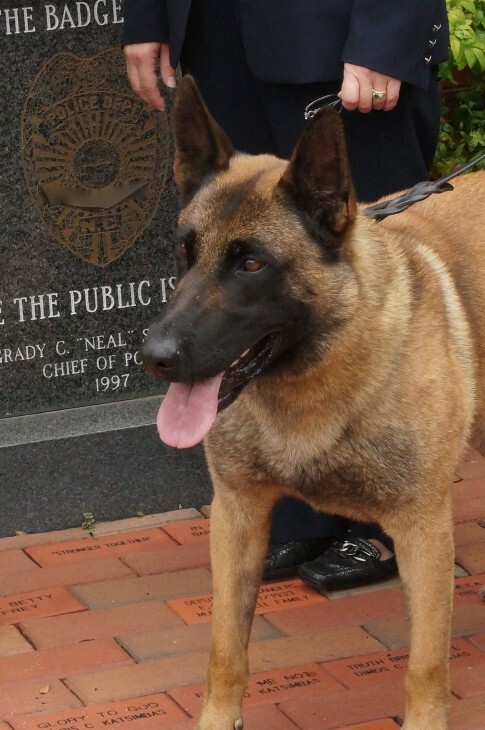 The police department and their officers said these dogs ” are just as important as their human counterparts…….they are one of our officers and a valuable part of the department. 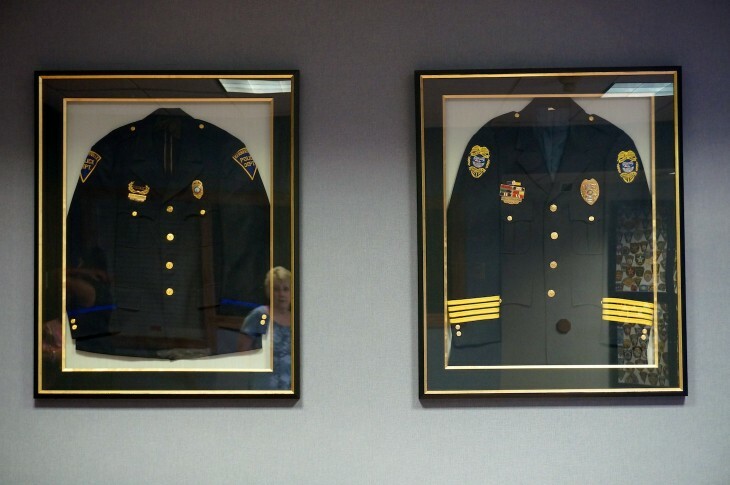 They have a job to do and they enjoy doing it.” said Police Department Captain Steven Bowman. 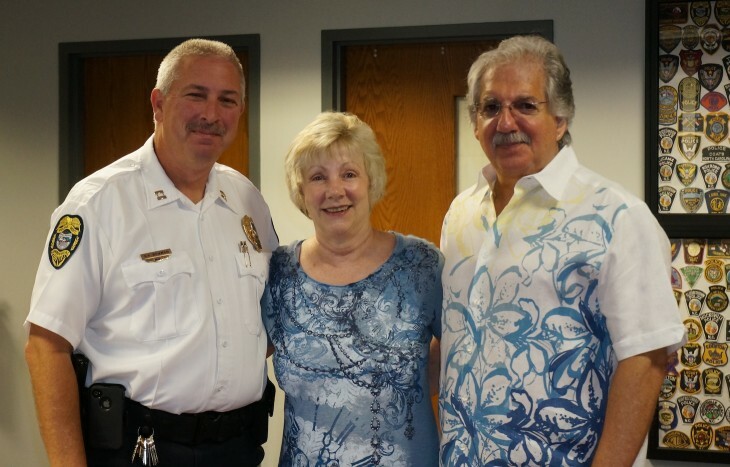 Buddy and Susan were honored at a ceremony at the police department. In attendance were two of the K-9 force along with their officer handlers, several other police officers, and the city mayor. These amazing canines help in criminal investigations, in searches for suspects and evidence, and also missing persons. In addition they participate in community events and demonstrations that help adults and especially children learn more about law enforcement. 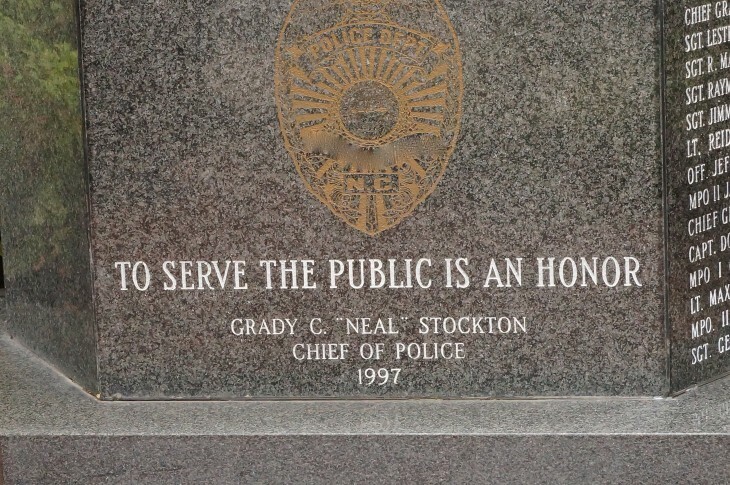 This city got their first K-9 in the mid 1990’s and it was also donated by Buddy and Susan. The department now has dogs that work every shift. I know many of my readers are animal lovers. Perhaps you might be interested in helping out your own local police or fire department in this valuable way. These masks saved many a dogs life during 9-11 when the officers and dogs worked tirelessly, to exhaustion, looking for survivors. Dog and handler got some oxygen assistance, and were back working. At the bottom of the post I found a link to information about the kits. In the lobby of the Law Enforcement Building with the new lifesaving rescue apparatus. Buddy and Susan in front of the Law Enforcement Building before the ceremony. I only ask for compassion and a kind word. 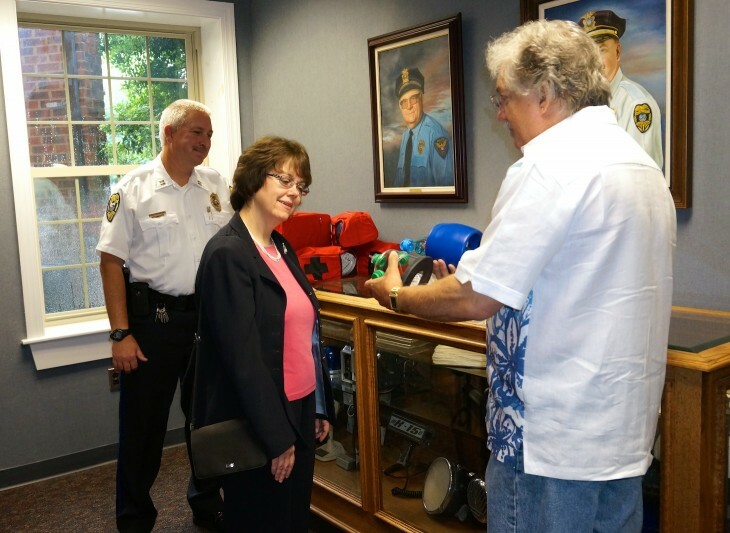 Buddy demonstrating to Captain Bowman and Mayor Morgan how the pet rescue oxygen units work. On the left is Officer Queen with canine Officer NITRO and on the far right is Officer Stokes with NEKO. Ceremony over, it is back to work. 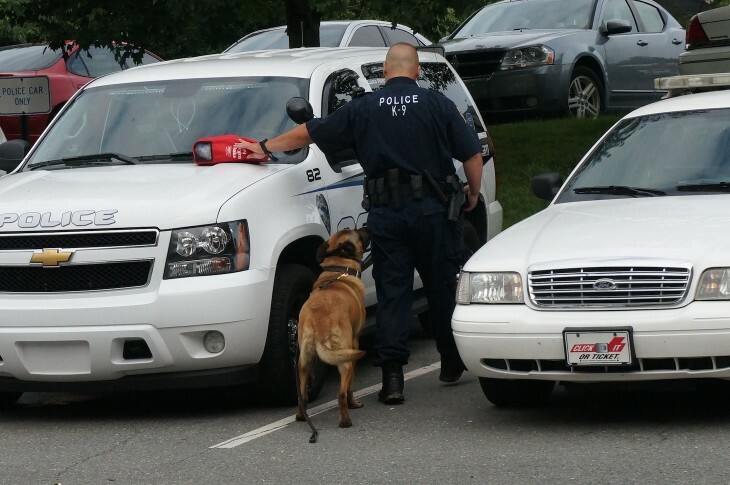 The dogs travel in specially equipped vans that allow the officers to also take suspects into custody, which was not previously possible when the dogs took up the back seat. Now the dog is in the back on one side, with a panel separating the dog from the suspect for transport. This makes it safer for an officer, since he can secure a suspect immediately without waiting for another officer to transport. There are also cameras all around the van. I know this post is a bit different from the usual, but it was a need I was unaware of until now thanks to Buddy and Susan. You might expect that the masks would be a provision automatically added to standard equipment when they add these dogs to the department, but I guess it is not always so. 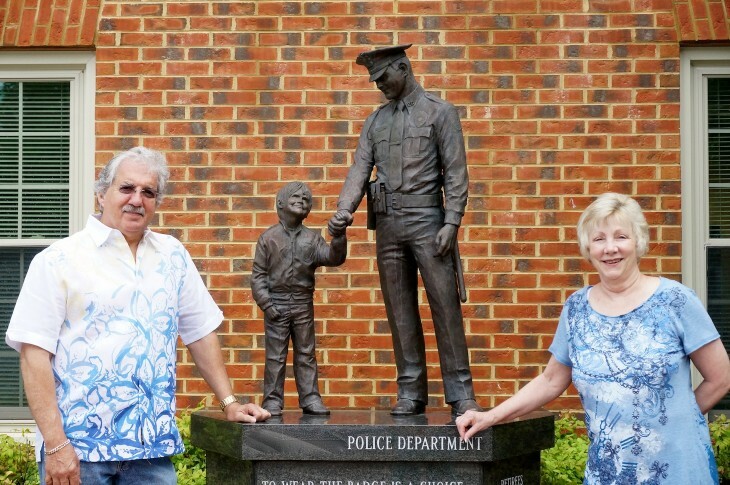 Thanks so much for the fine blog on Buddy and Susan’s donation to the Kernersville Police and Fire Dept. K-9 Units. I will be in touch about possibly using some passages in one of the future additions of Triad Happy Tails Magazine. The photos are excellent as well and we feel this would make an excellent local story in our local magazine. 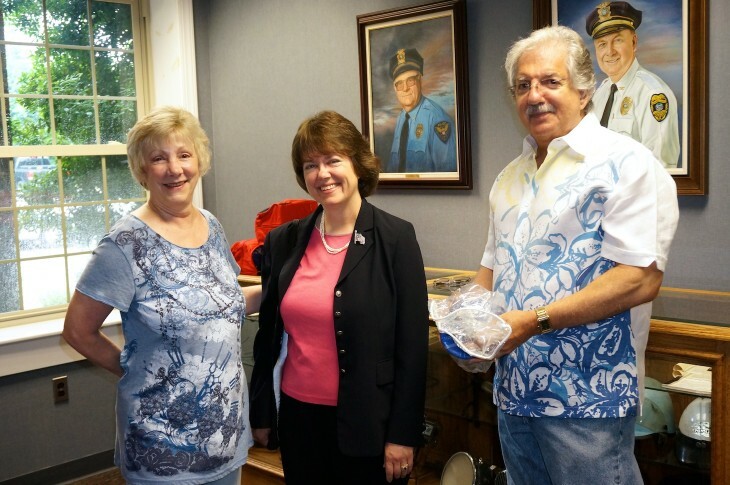 Buddy and Susan work tirelessly for the community and we like to honor them as well for their concern for all citizens, including the four legged ones! Take care, will be looking forward to reading more of your blogs. Regards, Deb Printup, editor Triad Happy Tails Magazine. Thank you Deb for commenting. It is always a boost to both the giver and the receiver when we try and make difference. It can be said that “I alone cannot change the world, but I can cast a stone across the waters to create many ripples.” What Buddy and Susan have made some ripples, as many of my readers have responded, eager to contribute in some way to their own communities, just like you are doing as well. What a wonderful surprise to open your Blog this morning and find this article. Thank you so much for your help in publicizing this event. It gave Susan an me so much pleasure to make this contribution to our community and to our wonderful K-9 Officers and Handlers. I hope they never have to use them, but if the need arises and it saves one K-9’s life, then we have accomplished what we set out to do. Our wish is that between your Blog and our donation many more people will be inspired to help their Police and Fire and Rescue Departments as we have. Any small part I can do through my blog to share info about these kinds of efforts is a privilege. Thank you for what you both did to improve the safety net for these K-9 police dogs and maybe even a pet member of our own family. Hoping the need never arises, but it is good to know it is available thanks to folks like you. This is a fabulous idea. Thanks so much for educating us. You and your friends are special people for taking up this cause. I have to give Buddy and Susan credit for sharing this with me, and it is a privilege to be able to let folks know small ways in which we can all make a big difference. 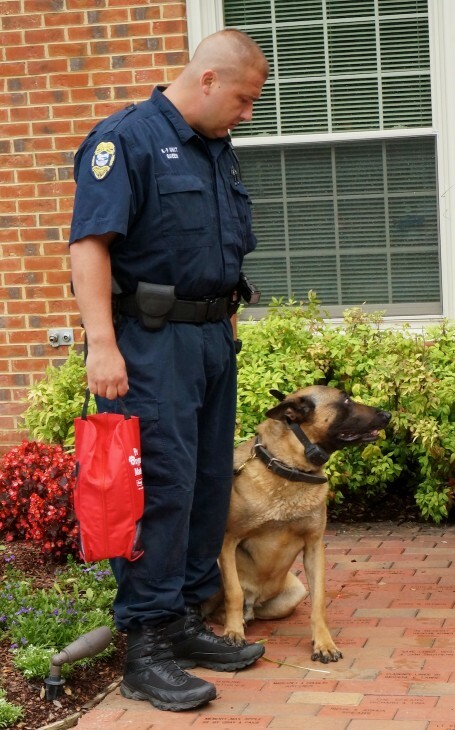 The officers who have these dogs were extremely grateful. 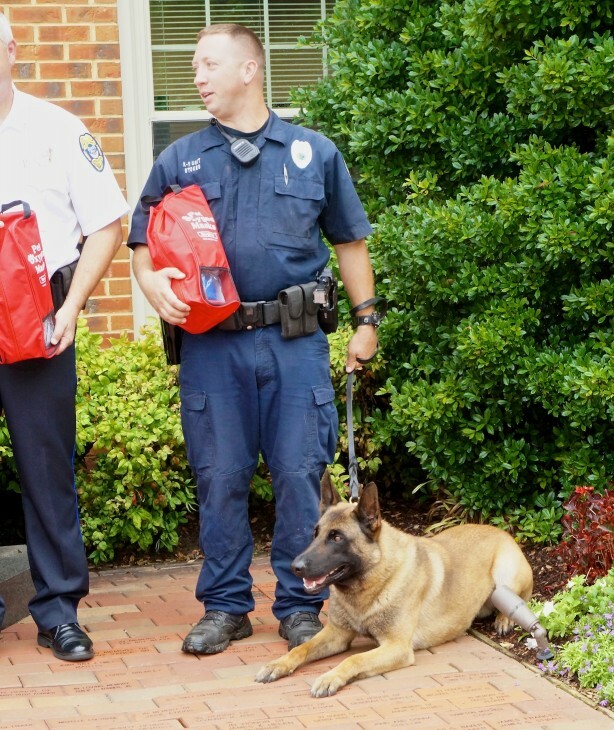 They really love and care about these dogs a lot…..the entire department does. Thanks for the feedback.